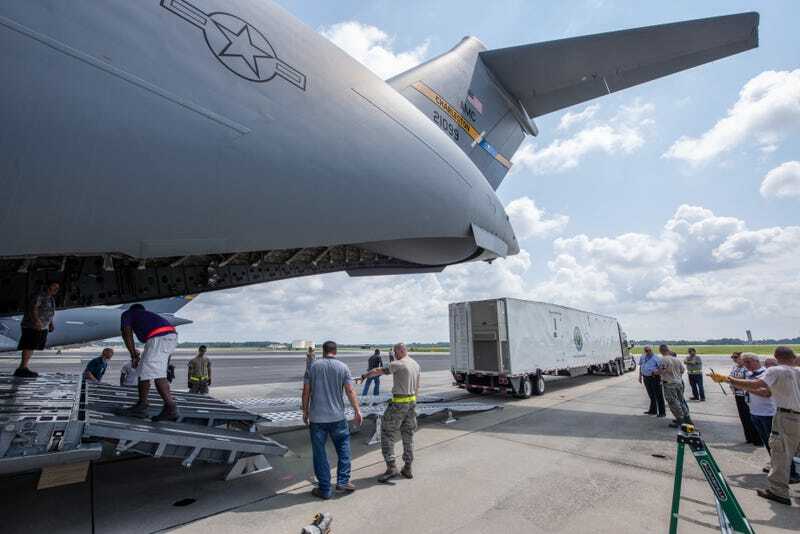 Tractor trailer being loaded on a C-17 Globemaster III. The Department of Defense wants a portable nuclear reactor the size of a main battle tank that’s capable of being lifted to overseas hot spots. The reactor would provide megawatts of power for U.S. forces, providing juice for everything from Xboxes to directed energy weapons. A mobile reactor would also make the military less reliant on diesel fuel for electrical generators, which in some cases must be sent along dangerous resupply lines. According to the Federal Business Opportunities website, the Department of Defense’s Strategic Capabilities Office has officially put out a request for information for a “Small Mobile Nuclear Reactor.” Based at the Pentagon, the Strategic Capabilities Office (SCO) spearheads the development of cutting edge military technology. Unlike the Defense Advanced Research Projects Agency, which is more concerned with developing technologies, the SCO is more focused on deliverable weapons systems and other tech. The reactor should have a power generation lifespan of at least three years, be semiautonomous with a minimum of operator manning, and pose no radiation risk. Iraqis and US Army soldiers arrive to the scene after a US Army convoy was attacked by a car bomb in the western part of Baghdad, Iraq, Sunday, May 1, 2005. The SCO envisions using the reactor at military outposts around the world, particularly in war zones such as Iraq/Syria and Afghanistan. Such outposts are typically powered by diesel fuel generators, but getting diesel to combat zones can be hazardous, particularly in Afghanistan where NATO fuel convoys have come under ambush by the Taliban. Nuclear power would eliminate the need for dangerous resupply missions. Against major military powers, a nuclear reactor would provide power to U.S. forces that could be temporarily cut off from resupply by enemy action. The RFI solicitation says the reactor could also be shipped into disaster zones, such as areas leveled by earthquakes, hurricanes, or floods, providing power for humanitarian assistance and disaster relief. Another reason for nuclear power is to provide electricity for power-hungry sensors and directed energy weapons. Coming up against potential adversaries like China and Russia includes sophisticated threats like cruise missiles, ballistic missiles, fifth generation combat aircraft such as the Chinese J-20 and Russian Su-57, and hyper-sonic weapons. U.S. ground forces will need lots of electrical power to keep sensors such as the Marine Corps’ new G/ATOR radar system up and running. The US Army’s new MEHEL laser weapon system. The biggest power draw, however, will the emerging class of laser weapons. The U.S. Army’s Mobile Expeditionary High Energy Laser (MEHEL) is a 5 kilowatt laser weapon meant to disable flying drones and mounted on a Stryker infantry armored vehicle. The service wants a 50 kilowatt laser by 2023. The more powerful the laser the larger targets it can engage at greater distances. A nuclear power plant could someday power a half dozen or more lasers ringing a U.S. outpost, zapping everything from drone swarms to incoming missiles. Despite more than seventy years of development, portable or even semi-portable nuclear reactors have not achieved the kind of success dreamed of early in the Nuclear Age. Between 1964 and 1972 a nuclear reactor, PM-3A, provided 1.8 megawatts of power to the U.S. research station at McMurdo Station, Antarctica. Unfortunately the reactor was also seriously buggy, malfunctioning 438 times over its operational lifespan resulting in a reliability rate of just 72 percent. It was also implicated in a spike in cancer-related deaths. The NB-36 bomber was a proposed nuclear-powered heavy strategic bomber that used the R-1 nuclear power plant for propulsion, but concerns about environmental damage should the plane crash shelved the nuclear-powered aircraft concept indefinitely. If you have a nuclear reactor you’d like the Strategic Capabilities Office to consider—and really, who doesn’t—read the Request for Information here. In five pages or less, including cover page, describe what your reactor can do for the Pentagon. Deadline is February 8, 2019. And U.S. citizens only, please.